If you're wondering who the masked rider is, it is very possible it is one of the two characters played by Jeff Bridges. In the last trailer released we got a glimpse of the young version of Bridges wearing and orange light suit (which looks very close to the one pictured above). Take a look for yourself below. Could this be one of the Bridges characters riding versus his son? Only time will tell. 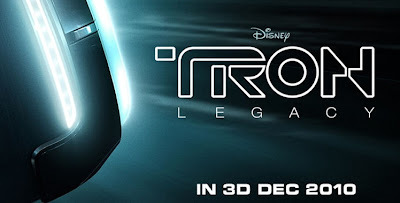 Expect more posters in the upcoming months for "Tron Legacy."